Platoon Commander, India Company 2004-2006. 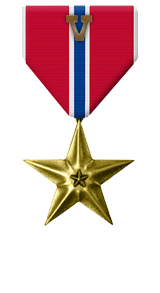 For heroic achievement in connection with combat operations involving conflict with an opposing force while serving as 1st Platoon Commander, Company I, 3d Battalion, 3d Marines, Regimental Combat Team-7, I Marine Expeditionary Force Forward, on 14 June 2006, in support of Operation IRAQI FREEDOM. 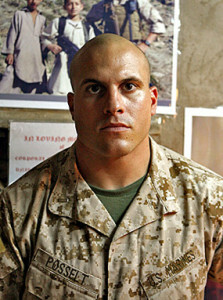 On this date, First Lieutenant Posselt was leading a combined Marine and Iraqi Army patrol when they were ambushed by enemy small arms fire from three locations. Maintaining impeccable bearing and uncommon composure, he immediately returned fire at the enemy, positioned the patrol members into locations where they could repel the attack, and relayed the situation to higher headquarters. Witnessing a fallen Marine caught in the kill zone and the enemy increasing their fires at the Marine’s position, First Lieutenant Posselt displayed complete disregard for his own personal safety by exposing himself to sustained enemy fire in order to move the casualty to a covered position. Although enemy fire was impacting all around his position, First Lieutenant Posselt calmly and courageously pulled the mortally wounded Marine and all of his gear out of the kill zone and into the safety of a nearby shop. First Lieutenant Posselt then directed another Marine to render first aid to the casualty while he coordinated link-up with adjacent units. He then moved back into the kill zone in order to direct the counter-attack. His courageous and decisive actions inspired the Marines and Iraqi Army soldiers, enabling them to successfully repel the enemy ambush. By his zealous initiative, courageous actions, and exceptional dedication to duty, First Lieutenant Posselt reflected great credit upon himself and upheld the highest traditions of the Marine Corps and the United States Naval Service.